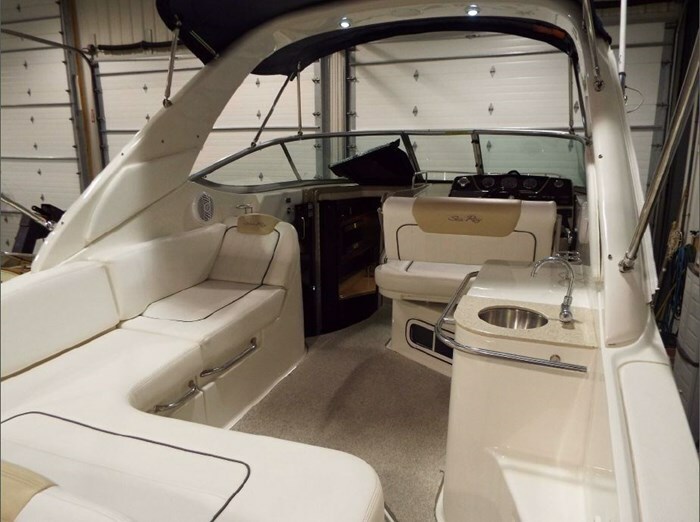 The Searay Sundancer 270 is designed for incredible stability, comfort and handling. The 270 offers more space, more seating, and more luxury for couples or a family looking for a compact express cruiser with big boat features. 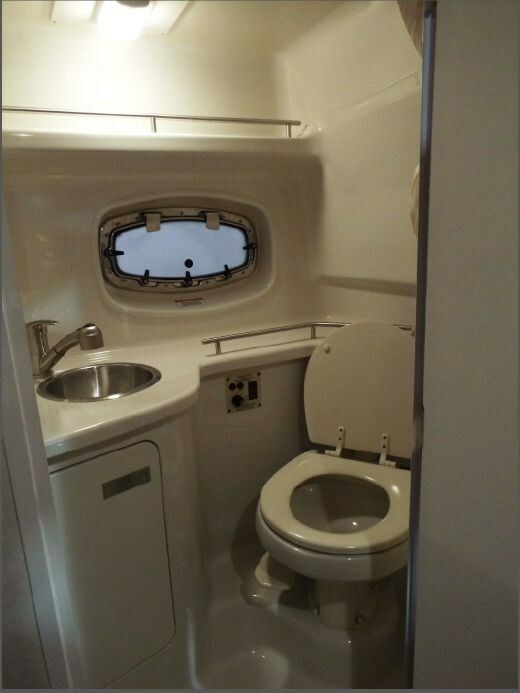 The cockpit offers a huge lounge dinette and a wet bar as well as a folding aft seat that converts to a transom sun pad. There's even a full audio control module on the swim step and at night you've got underwater lights for ambiance. 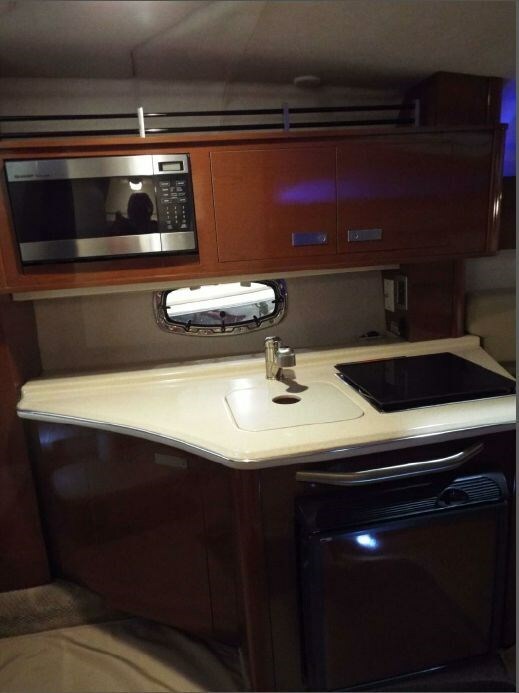 Below decks you'll find a gourmet galley with Corian counters and sink, a gas cooktop, microwave oven and refrigerator. Her interior is elegantly finished in complimentary light and dark wood grains. 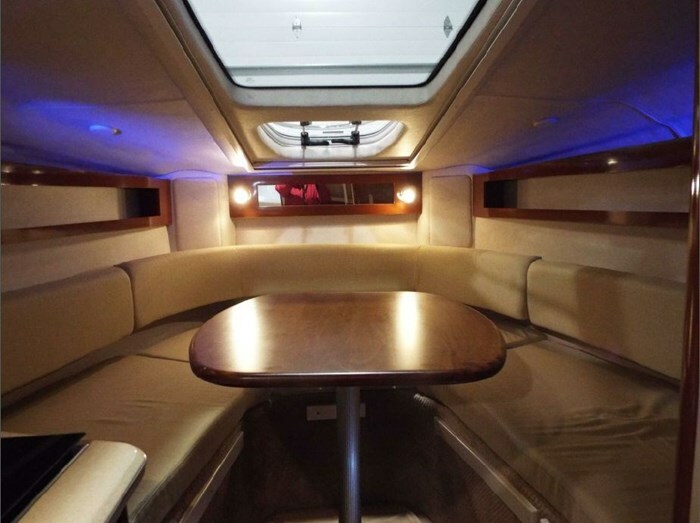 She sleeps 4 in two double berths; the dinette converts to a large double. The private head and shower are spacious and well-appointed with a Vacuflush fresh water head. 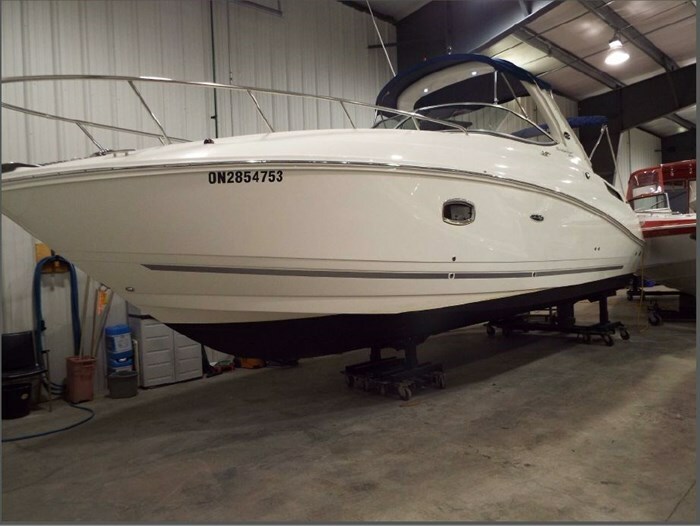 Entertaining, overnighting, waterskiing, cruising, trailering to new boating areas, Sea Ray’s 270 can do it all while still delivering the luxurious extras that owners have come to expect on much larger Sundancers. Simply put, this is one of the most multi-talented boats from the company that almost single-handedly reinvented the category with the mid-cabin genre of express cruiser boats. 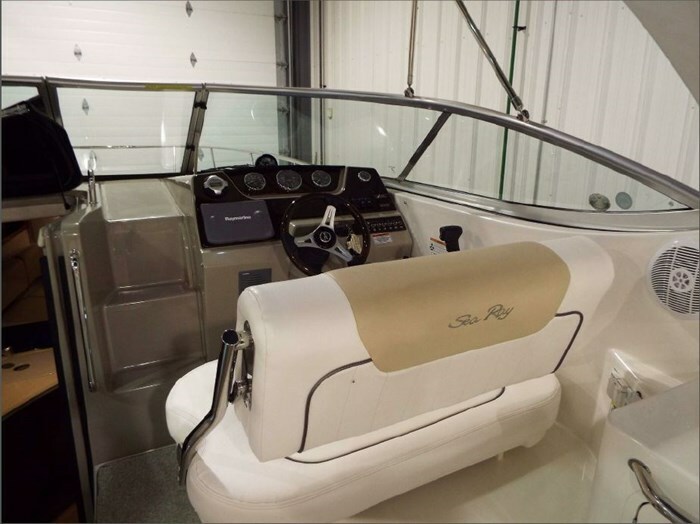 Featuring an 8-foot, 10-inch beam, the 270 Sundancer boasts a wide, leisure-ready cockpit with an ingeniously designed double helm seat that pivots to face aft when the boat is at rest. The 270 can keep the whole crew hydrated with a removable carry-on cooler and a wet bar that has a handsome Corian countertop and stainless-steel sink. Add the optional built-in grill here to create the perfect setup for cookouts with friends and family. The extended beam also creates a bigger-than-life feel by offering a stairwell-like portside companionway that leads down into the cabin. 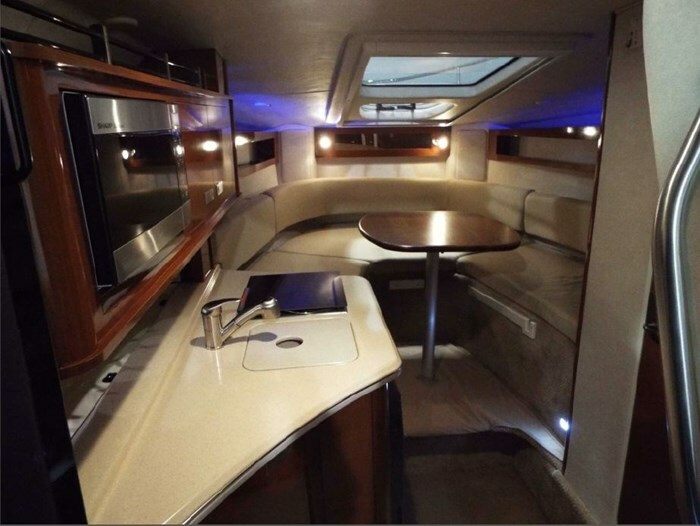 The interior of the 270 Sundancer is a bright and relaxed space, sure to impress the most discerning boater. A tinted skylight and two oversized hull windows allow a flood of natural light — and an optional cabin entry screen door lets in outside air — giving the 270’s cabin an open and breezy feel. A spacious V-berth/dinette with dedicated filler cushion and table storage means hassle-free overnight stays for owners; likewise, a mid-stateroom double berth makes comfortable quarters for cruising companions. 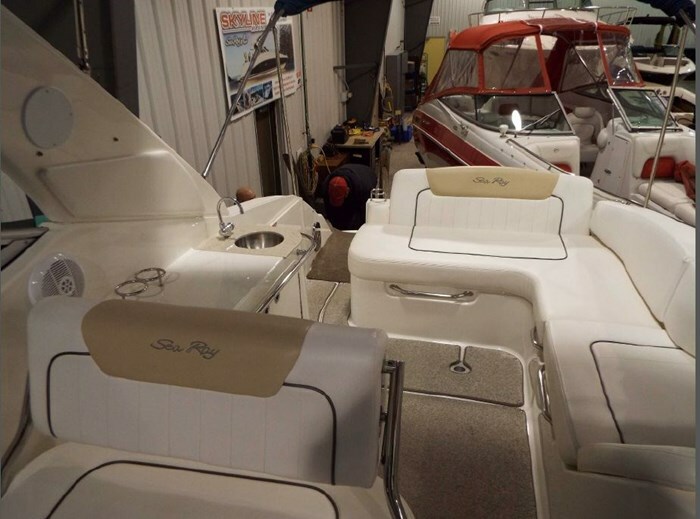 The galley and head are two more examples of Sea Ray’s customer-driven design in action, featuring full appliances and upscale equipment as standards, including a stainless-steel microwave and a VacuFlush head. Optional amenities like a 12-inch, flip-down TV forward, teak-and-holly cabin flooring, and 8,000-BTU air conditioning/heating are examples of Sea Ray’s commitment to making the most inviting and sophisticated sport cruisers on the water. Topside, under the electrically actuated engine hatch, a standard MerCruiser 350 Magnum MPI Bravo III gas sterndrive (300 hp - 224 kW) propels the 270 to a stirring 40 mph top end. Or, if owners feel the need for even more speed, additional power options include a MerCruiser MX 6.2 MPI DTS Bravo III (320 hp - 239 kW) or 496 Magnum DTS Bravo III (375 hp - 280 kW) gas sterndrive, or a Yanmar 6LPA-STZP SD Bravo III (301 hp - 232 kW) diesel sterndrive. All gas engines are available with corrosion- resistant Mercury SeaCore drives. The modern helm is as elegant as it is functional, featuring custom Sea Ray SmartCraft instruments with low-glare blue night lighting, weatherproof lighted chrome toggle switches, and a tilt steering wheel with black spokes and a polished centerpiece. There’s also a dedicated area for add-on electronics, and for the standard VHF radio. A final surprise awaits at the stern of the boat, where pulling a handle unfolds a two-person transom seat alongside the standard extended swim platform. 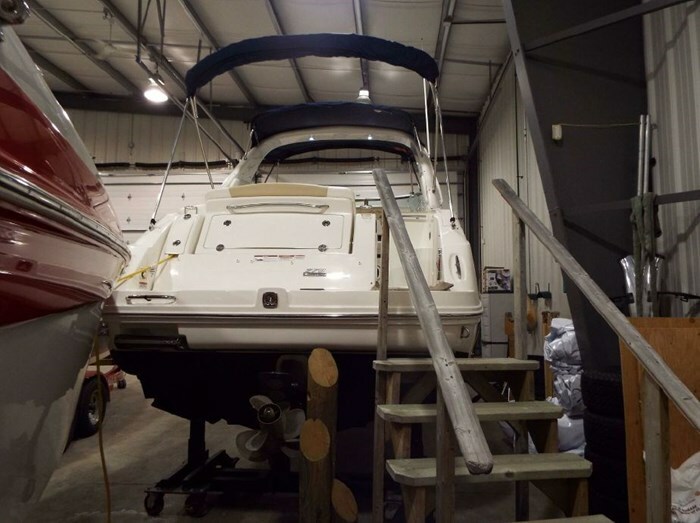 A four-step, stainless-steel ladder gets owners and guests in and out of the water easily, and an optional transom stereo remote keeps things kicking without requiring the host to run to the helm to change the tunes. Dealer Name: United City Yachts Inc. Send a message to United City Yachts Inc.